Bathtub liners and wall surrounds are outstanding answers if you have an extremely worn, damaged, rusted, or otherwise abused bathtub. 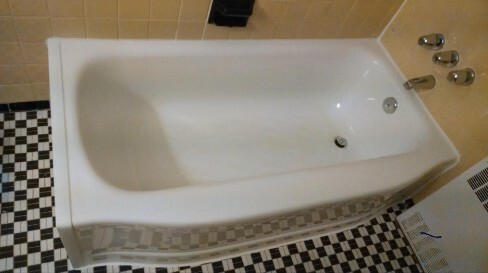 The bathtub will have a whole new life without having to be demolished and replaced, and the work can normally be completed in less than a day's time and perhaps even in a few hours! Replacing a bathtub is very expensive, time consuming, and messy. A liner system saves you thousands of dollars as well as time and many headaches. The workmen are bonded and specialized technicians and are not just ordinary handymen; they are well-experienced bathroom remodelers. The liner can redeem even the most severely damaged tub. Manufactured from quarter-inch solid-core vinyl, it fits over the existing tub, is practically invincible to physical damage, provides a high-gloss finish, is easy to maintain, is HUD tested and approved, and can last 20 years or longer. The liner does not crack, peel, chip, or stain, and no paint or offensive and dangerous chemicals are used. Each installation includes a new overflow and drain fixture and silicone caulking. The tub is ready for use the very next day! They are an excellent alternative to messy grout and tile. The material used is similar to the bathtub liners and has the same durability. Available are simulated-tile and flat-panel models, with the former retaining the classic tile look while eliminating the hassles of maintaining grout, which means no more flakes, chips, or mildew. A surround can fit over the walls, cover all the way from the floor to the top of the tile, or to the ceiling, or be on both walls and ceiling. Any existing water damage or leaks are repaired free of charge by the technicians before installation. Again, no harsh chemicals are used, and the bathroom is ready to be used the next day. Porcelite Enterprises is proud to be the only North America company that manufactures and also does not outsource but installs its own custom-made liners and surrounds. Every make and model of bathtub is included in their inventory of more than 100 molds. Their facility in Beltsville, Maryland, has served the Washington DC//Baltimore area since 1961. The entire design and manufacturing process from your first phone call or consultation to the measurements and initial estimate to the actual installation occurs within one week and not the four to six weeks of their competitors. The timing depends on the configuration of the bathroom since no two are alike. Money is saved because there is no extra cost by middlemen and that double markup, and downtime is kept to a minimum.